Tibetan Life, Issue #02 -- Happy Tibetan New Year! Did you know that Tibetan New Year falls on Valentine's Day this year? How do you say 'Happy New Year' in the Tibetan language? (Lo means 'year' and Sar, short for Sarpo means 'new'. Read more about Losar traditions here. Can I cut my Tibetan Terrier puppie's fur short? Is it proper to give a Khata to a visiting Geshe? What warm up exercise do you do before doing the five Tibetan exercises? What is the history of Tibetan Tattoos? The Tibetan language does not have a word for 'guilt'. This is an emotion that has no benefit at all. When a Tibetan or a Buddhist make a mistake that they are aware of, they simply regret the action and promise to try to not to repeat it again in the future. They don't beat themselves up over something in the past repeatedly; this type of action brings no benefit to anyone. Stuck for that perfect Valentines Day gift? Don't panic, I think I can help you. Yes, it's true, roses and chocolates can be nice for that special someone but...a beautiful shirt with their name translated into the exotic Tibetan language on it can be really exciting to receive! And...what a perfect way to show your support for Tibet! Who needs a bit of gentle and easy exercise? 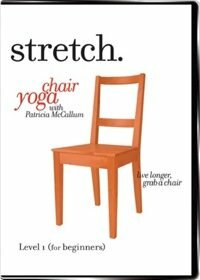 Stretch Chair Yoga is a series of low-impact, safe and gentle exercises, postures and breathing techniques will improve your quality of life no matter how old you are. Wondering how you can help Tibet?